Be calm, no matter what may befall you. Rest in Me. Be patient, and let patience have her perfect work. Never think things overwhelming. How can you be overwhelmed when I am with you? Do not feel the strain of life. There is no strain for My children. Do you not see I am a Master Instrument-maker? Have I not fashioned each part? Do I not know just what it can bear without strain? Would I, the Maker of so delicate an instrument, ask of it anything that could destroy or strain? No! The strain is only when you are serving another master, the world, fame, the good opinion of men -- or carrying two day's burden on the one day. Remember, that it must not be. Reminds me of Matthew 6:33-34! I began a new sermon series on prayer today entitled "Praying with the Big Guys." Spoke on Jonah and his repentant prayer from the midst of a big fish. God heard his prayer and delivered him. God is concerned about us as well when we are in the belly of the fish, at our point of desperation and hopelessness. God always responds to a repentant prayer. The sermon should be posted on www.hcanglican.org tonight. 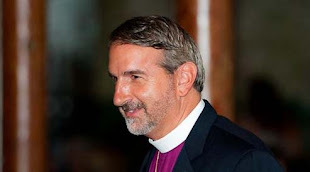 This past week I went to Mere Anglicanism, a gathering of evangelical Anglicans in Charleston. It was like a reunion being able to visit with some of my heroes in the modern Anglican movement: Bishop Fitz Allison, Bishop Alec Dickson, Bishop Ed Salmon. The event was held at historic St. Philip's Church, a vibrant parish in the Episcopal Diocese of South Carolina. Titled "The Once and Future Church," we heard some great presentations on the evangelical contributions of Anglicanism. Richard Turnbull, the Principal of Wycliff Hall in Oxford highlighted the eighteen and nineteenth centuries. The Bishop of London, Richard Chartres, spoke on a previous bishop of London, Henry Compton, and his emphasis on missions in the colonies back in the late 1600's. Dr. John McCardell, Vice Chancellor at the University of the South, spoke of the ramifications and influence of the Great Beaufort Revival of 1831. Absolutely incredible! Bishop Michael Nazir-Ali, the retired bishop of Rochester, England, spoke about how we have lost our way in recent decades. Bishop Mark Lawrence, the Episcopal bishop of South Carolina, spoke about his challenges and the future of Anglicanism in South Carolina. Lastly, we had worship with Archbishop Ben Kwashi preaching on sharing the faith. Archbishop Kwashi is from Jos, Nigeria and his ministry is touching hundreds of thousands in Nigeria in the midst of Islamic persecution and aggression. Our planet is not in short supply of men and women with abilities to lead; what is lacking is the failure to lead from a godly perspective. The challenges and conflicts in our world today need a new kind of leadership. It needs genuine, wise, courageous and compassionate leadership. The source of true wisdom comes from the Fatherhood of God. People who are in any kind of leadership or position of authority will ultimately give account of their stewardship. Wise leaders are accountable first to God and then to the people they serve. All leaders will kneel before God one day to give an account of their stewardship. A leader's vision must not only be embraced by the people but must be communicated is such a way that it motivates the people and honors God. I just watched again The Star of Bethlehem a DVD by Rick Larson (see http://bethlehemstar.net/) on the account of the magi following the star in Matthew's Gospel. Rick's story is fascinating as to how the Lord guided him to discover the message the heavens were declaring. The awesome God who created the heavens and earth, who spoke creation into being, and who sent his Son to be the savior of the world (1 John 4:14), spoke loud and clear with the sky about Messiah's birth. How blessed we are to live in a time and place where technology and history reveal so many confirming signs of the Revelation of God, His Word!! As the stars proclaim the Glory of God, may our lives, our words, and our deeds proclaim His glory as well. O God, by the leading of a star you manifested your only Son to the peoples of earth: Lead us, who know you now by faith, to your presence, where we may see you glory face to face; through Jesus the Messiah, our Lord, who lives and reigns with you and Holy Spirit, one God, now and forever. Amen. Failure is not fatal to leadership. Even great leaders make mistakes. Failure is necessary for leadership development and spiritual growth. God will sometimes use your failures to prepare you for great service. Excellence is the goal of all pure leadership. Leaders must commit to the high ethical standard of their leadership responsibility. Ethical leaders serve as if they working for God. Followers cherish those who serve with pure heart and excellent spirit. A true leader must learn and know how to delegate. A leader who does not delegate will be burned-out and may not accomplish much. Courage is one the greatest ingredients of supernatural leadership. No one can become a great leader without godly character and strong courage.